TESTED TO BE THE BEST. LOWEST HEAT RISE IN STRONG SUN AND LOW WIND. 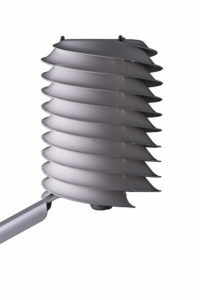 DOUBLE HELIX DESIGN PROTECTS YOUR SENSOR FROM HIGH WINDS, SNOW AND RAIN. Very good solar shielding efficiency & ventilation. Spiral flow keeps sensors clean. Patented helical design offers the advantage of fan aspirated radiation shield accuracy with the reliability of naturally aspirated radiation shields. Custom sized adapter to fit any sensor up to 26mm diameter is available. A universal clamp-style adapter comes standard to fit any 11mm to 18 mm diameter temperature and humidity probes.